When using timber deck posts, it is highly recommended and considered best practise to connect your timber posts to the deck footings using a metal stirrup or bracket. Installing timber deck posts directly into concrete deck footings will encourage dry rot in your posts. This is outlined in our “15 Most Common Deck Construction Mistakes” report. The image to the left is a very poor example of installing a stirrup into a concrete footing. When you install your stirrups into your concrete deck footings you need to keep the top cross bar (this is what your timber post sits on) above the top of the concrete footing by 75mm. In this example the builder has not installed the stirrup deep enough into the concrete footing leaving much larger gap than 75mm. In an attempt to repair the incorrect installation, the builder has added extra concrete around the stirrup. 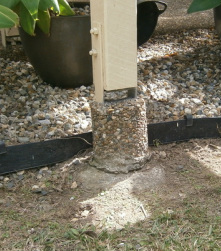 You can do this is some instances, however you need to maintain a minimum of 50mm of concrete around the stirrup and keep the top of the concrete below the bottom of the post by 75mm. As you can see this never happened in this example. To learn how to install deck footings correctly you can purchase your own copy of our “Digging and Installing Footings” guide. Next PostNext Cutting your decking boards neatly around posts.